RELATED: Jon Gold interviews: Blogtalkradio.com’s Ameros Radio. Listen here and Sibel Edmonds’ Boiling Frogs, here. The next year, led by 9/11 widows Lorie Van Auken, Patty Casazza, Mindy Kleinberg and Monica Gabrielle, a group of family members issued a statement questioning the “entire veracity of the 9/11 Report .” Along with bereaved father Bob McIlvaine, they mounted a cogent challenge to the corporate media which had uncritically accepted the Report . But the news media continued to afford scant coverage to their challenge. Two years later, Gold attended a preview of “Press for Truth,” which he believes is the “most important documentary of our age,” but which received almost no media coverage at the time. Nor has it received much since. By 2006, Gold had come under the influence of Paul Thompson and his amazing research project, www.historycommons.org. Because of Gold’s affinity for this approach and his closeness to the families of victims, Gold became concerned that “too much emphasis was being placed on the physical aspects of 911.” (This extended the perspectives of Michael Ruppert who, several years before, had rejected the utility of physical evidence). In contrast, Gold was impressed with the “Eleventh Day”-of-the-month street actions popularized by Cosmos, a Bay Area activist. Although Gold believes that “no better action [has been] devised for this cause” (p. 55), he doesn’t say why. 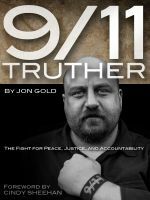 In 2008, increasingly concerned that the corporate media were refusing to cover 9/11 critique, Gold made a series of ten videos about different 9/11 family members. (These are available at 911Truth.org). Throughout his subsequent years as a 9/11 activist, Gold has made extensive use of his talents as a designer. Though he claims, “I’m a regular, everyday person who’s paying attention and trying to make a difference,” he’s obviously a very bright fellow who’s devoted many years to learning in service of the cause. Not surprisingly, Gold expressed his concerns about extravagant claims, such as the belief that beams from space had brought down the Towers, and conspiracy mongering, which he felt characterized the statements of Alex Jones and WeAreChange. Somewhat more surprisingly, by mid-decade Gold had concluded that belief in controlled demolition was becoming a kind of cultish litmus test (p. 105). Gold cautioned not only against “speculative theories” but against “disruptive behavior” (within the movement). He also called for “self critique”; in a prophetic call to action, he pointed out that “we can’t sit on websites arguing whose theory is right or wrong until this issue disappears into the ether” (p. 88). Gold himself made significant efforts to work with the peace movement. In 2009, he met Cindy Sheehan and became involved with “Peace of the Action,” based on the tactic of “putting their bodies on the gears of the machine to stop this empire.” His work with Sheehan continued into 2010, when her efforts evolved into Camp OUT NOW at the Washington Monument and a demonstration using false coffins (p. 80). Exhaustion and disillusionment were becoming evident. The Sizzlin’ Summer Protests, an extension of Camp OUT NOW, were “such a disappointment to us when no one showed up.” In 2009 and 2010, Gold also worked with NYCCAN (New York City Coalition for Accountability Now); when, later that year, this initiative also failed, he reports it “was the ‘last straw’ for me” (p.74). The most prevalent of these people who bombarded me, though, were the 9/11 ‘Truthers.’ I was harassed all over the world by them and I swear if one more person asked me if I saw ‘Loose Change’ I was going to forget my pacifism and punch him (it was always a him) in the face. The sad thing about this harassment was that I never believed the so-called official story of 9/11 and would have tended to be an ally to these people, but they were so rude and pushy. And, I didn’t feel that I had the time or the inclination to wade through the stacks of information that they tried to force on me… . I left a lot of that material in cabs or garbage cans. The implication is that Jon Gold was one of the few “truthers” who favorably impressed Sheehan — and that he, perhaps more than any other individual, helped to bring her into the truth movement. Readers might like to know how he succeeded after so many others had failed. When Gold urged that we let “the facts speak for themselves” (pp. 131ff), he typically means grounded journalistic research such as that done by Paul Thompson and others at historycommons.org. Gold clearly favors foreknowledge arguments pointing to government involvement; thus we’re not surprised when he links to a network story (MSNBC 9/9/01) revealing that the Bush administration was planning an attack on Afghanistan. Gold also provides solid information on the CIA’s Office of Technical Services, which made and released an Osama bin Laden propaganda video. The book also contributes valuable research on the suspicious spike in insider trading just before the attacks (pp. 157, 160-62) and on the profits made from the War on Terror (pp. 176-77). Though Gold is also well versed in Philip Shenon’s The Commisson , he does not provide much critique of that book. His strongest affinity is with whistleblowers, particularly those associated with families of the victims who were ignored by the Commission. His interest in foreknowledge also leads him to retell the story of the Israelis seen dancing for joy on the roof of an Urban Moving Systems van (pp. 147ff). The van’s location, in Liberty State Park just across the Hudson River from the stricken Towers, was also telling. Five Israelis were arrested but soon released and allowed to leave the country. Just three days later, on 9/14/01, the owner of the company fled to Israel. The fact that Gold is Jewish should counter potential suspicion of anti-Semitism when he discusses likely Israeli/Mossad involvement. The final section of 9/11 Truther , “Random Articles from Over the Years,” is sometimes repetitive and less compelling. In addition, the book would be a better if it had an index. Overall, though, it’s an important retrospective that will encourage many activists to introspect on where they’ve been and where they need to go. Paul W. Rea, PhD, is the author of Mounting Evidence (2011). The most complete bibliography on 9/11 is available at www.mountingevidence.org . Read another review by Nafeez Ahmed.